At the top of the page an inscription describes one of Saint Hedwig's charitable acts: "Here she convinces her husband to have a monastery for Cistercian nuns built at Trebnitz with his own money." Hedwig stands with her husband, supervising the construction of the building. Her emphatic gesture suggests that, although Henry supplied the funds, she was the guiding force of the project. Henry wears full ducal regalia, with numerous heraldic devices, while Hedwig is modestly dressed. On the right, laborers construct the Gothic building, using scaffolding and a pulley system. 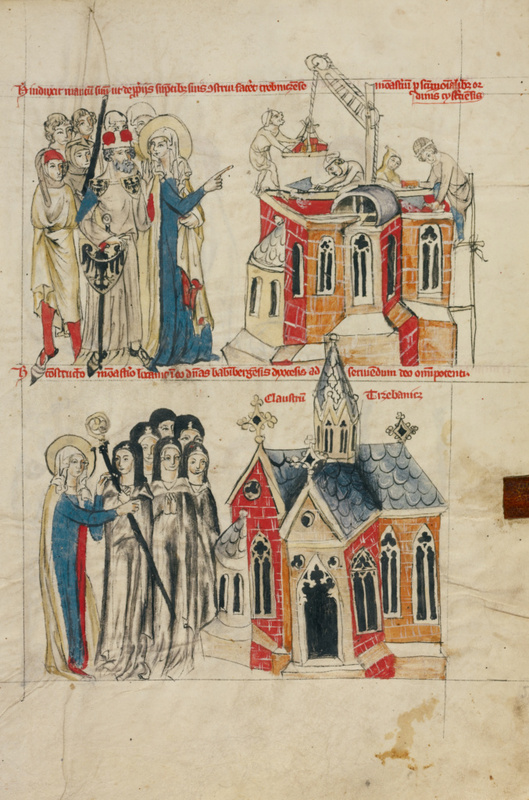 In the miniature below, Hedwig ushers a group of nuns and their abbess into the now-completed convent church. Hedwig actively supported religious foundations, especially those for women. Upon the death of her husband, Hedwig retired to this nunnery at Trebnitz.